U.S. Claims Silver at U-18 Worlds - College Hockey, Inc.
Roster of 21 NCAA commits falls to Finland in championship game. 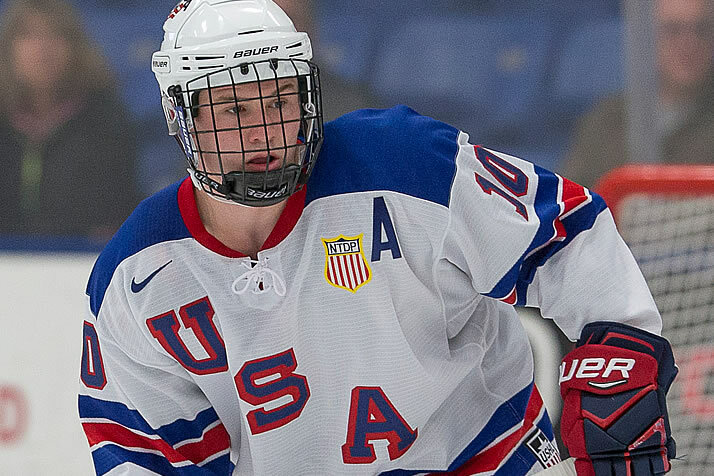 Wisconsin commit Ty Emberson finished with four assists in the Under-18 World Championship. The United States Under-18 Men’s National Team, featuring a roster filled with 21 players committed to NCAA schools, captured the silver medal at the 2018 Under-18 World Championship in Russia. The U.S. won three straight games before falling to Finland, 3-2, in a back-and-forth gold medal game. The Finns, who featured Wisconsin commit Sampo Ranta, scored a shorthanded goal midway through the third period and held on for the win in the rematch of last year’s gold medal game. Quinnipiac head coach Rand Pecknold was among Appert’s assistants. They led a team that started the tournament with one win in its first three games before winning its next three games by a combined 17-2 score. Underage and uncommitted U.S. star Jack Hughes, whose brother Quinn was a freshman at Michigan this season, led the tournament in scoring and was named the tournament MVP. Oliver Wahlstrom (Harvard) and Cam York (Boston College) joined Hughes on the media’s all-star team. Wahlstrom, Joel Farabee (Boston University) and captain Mattias Samuelsson (Western Michigan) were named the team’s top three players by the coaching staff. Ranta had a goal and an assist in seven games en route to the gold medal. Other commits in the tournament included Canada’s Jack McBain (Boston College) and Jonathan Tychonick (North Dakota). The United States appeared in its 14th gold-medal game in the 21-year history of the Under-18 World Championship. It has won gold 10 times.